An exceptional and beautifully shaped Italian Mid century sofa attributed to Gio Ponti. This elegant piece has been reupholstered in a striking burnt orange velvet with contrasting fabric, both from Le Lievre Paris, and would fabulous in a hall or the bay window of a living room or bedroom. A TEMPLATE HAS BEEN TAKEN OF THIS SOFA. 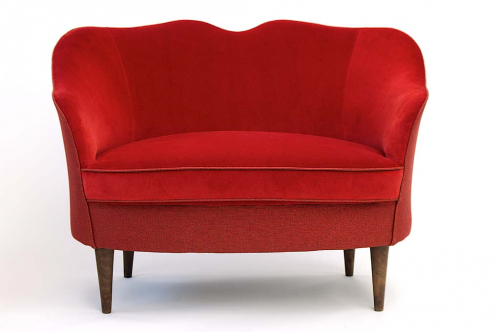 SHOULD YOU REQUIRE A COPY, EITHER UPHOLSTERED BY US IN ANY FABRIC OF YOUR CHOOSING, OR BY YOURSELF, PLEASE CONTACT US.